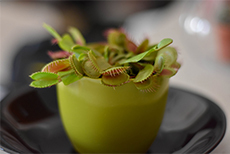 So you are new to Carnivorous Plants? Carnivorous Plants are beautiful and exciting plants which attract, catch, and absorb insects. Some are also suitable house plants, needing only minimal attention and a sunny windowsill to thrive. Like many others, you will come to cherish your carnivorous plants above all others. As a beginner the Carnivorous Plant you desire is forgiving, fast growing, and showy. We have plenty of plant that meet these criteria. We also provide valuable information to make sure your Carnivorous Plants thrives.